An ATC officer gives a green to the first of a wave of RAF Dakotas about to take off. Самолеты York британских ВВС разгружаются в аэропорту Гатов, где полеты выполнялись днем и ночью. Сделанные на базе бомбардировщика Lancaster, самолеты Avro York были самыми современными машинами, которые Великобритания могла предложить в начале поставок. Эти машины принадлежали 241-й эскадрилье оперативного переобучения. The flow of aircraft was maintained day and night. 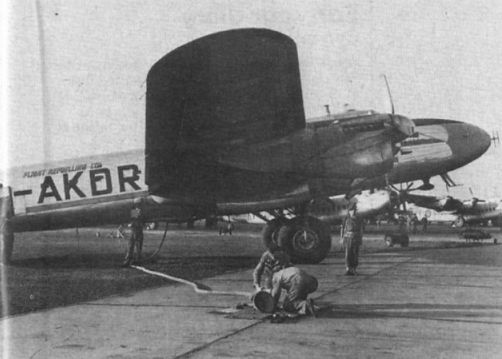 The first Avro York in this queue, MW105, was the first all-freight version of the type. A wave of Yorks have landed and are marshalled in front of the unloading hangars, where German labour did the muscle work. Halifax G-AIWP of London Aero and Motor Services Ltd, operated on the Berlin Airlift by Skyflight Ltd, was sold for scrap in March 1950. Lancashire Aircraft Corporation Ltd’s Halifax G-AIHY, the aircraft the author flew in during his tour of the airlift. ’HY was damaged in a taxying accident at Le Bourget in December 1949. Avro Tudor 5 G-AKBZ Star Falcon was destined for British South American Airways, but was converted into a tanker and, with others, served on the lift. 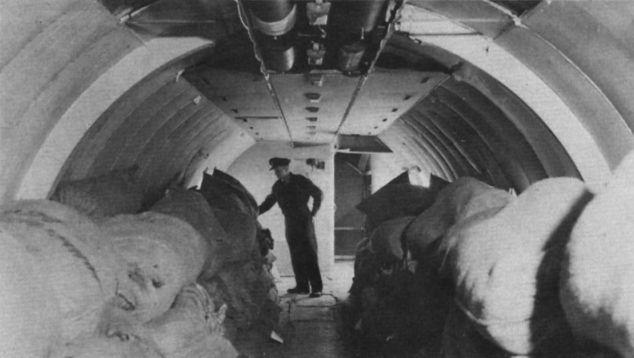 An RAF checker inspects a load of flour inside an Avro Tudor II. Avro Lancastrian G-AKDR about to discharge fuel via a pipe into an underground tank. Owned by Flight Refuelling Ltd, this aircraft was withdrawn from use in May 1951.